Co. Galway: Ballindoon (2), Clifden (3), Renvyle (3), Roundstone (4). The Board also included 4 ex officio Guardians, making a total of 16. The Guardians met each week on Wednesday at noon. The population falling within the Union at the 1831 census had been 28,639 with divisions ranging in size from Ballindoon (population 4,793) to Roundstone (9,942). The new workhouse was designed by George Wilkinson and occupied a four acre site at the south side of the Galway Road, about a qurter of a mile to the east of Clifden. It cost £3,600 to build plus £900 for fixtures and fittings, and could accommodate 300. It was declared fit for the admission of paupers on 22nd December 1845, although the first inmates did not move in until 8th March 1847. The buildings followed Wilkinson's typical layout. An entrance and administrative block at the west contained a porter's room and waiting room at the centre with the Guardians' board room on the first floor above. This was later extended at each side with a boys' school at its south and a girls' school at the north. The main accommodation block housed the Master's quarters at the centre, and male and female wings to each side. At the rear, a range of single-storey utility rooms such as bakehouse and washhouse connected through to the infirmary and idiots' wards via a central spine containing the chapel and dining-hall. A fever hospital was subsequently erected at the east of the workhouse. A dispensary was located at the roadside at the north of the site. A supposed view of the workhouse appeared in the Illustrated London News in 1850. The building bears little resemblance to any other Irish workhouse so may be an imaginative impression by an absent artist. Clifden came under great pressure during the famine years of 1846-48, and the union effectively became bankrupt. Conditions in the workhouse were desperate as indicated by the slightly abridged extract from a report (below) written on 25 December 1847 by Poor Law Inspector John Deane for the Irish Poor Law Commissioners. I now have to call the attention of the Commissioners to the state of the the workhouse, which I regret to say is in a lamentable condition, owing to the spread of disease therein... The inmates of the house are crowded together in a day-room breathing a tainted atmosphere; there is an insufficient supply of bedding and clothing. The rain pours down through the ventilating turrets into the rooms, and the paupers are thus subjected to increased liability of infection. Directions have been given to provide increased accommodation, such as can be obtained. The contractor has been directed to supply additional bedding. A minute appears on the proceedings of the Guardians directing advertisements to be issued for tenders for the keeping in repair [of] the house according to the printed specifications furnished to me. All this has been formally done, and yet I can tell the Commissioners from the experience I have obtained since my residence here, that it will be no easy matter to determine when these orders shall be completed. The contractor for clothing must be paid a portion of his debt before he gives any additional credit. The slater, carpenter, mason, &c. will urge the state of the weather as being against their respective operations; and while this delay is being experienced, pestilence rages among the wretched inmates. On visiting the house, a few days ago, I was disgusted at learning that the dormitories (particularly those appropriated for children) are not supplied with night-buckets. I forbear to describe the abominations consequent on this. The buckets had been long since ordered by the Guardians; but the idle laziness of the tradesmen occasioned a delay in the execution of the order, and the result was as I have stated. Now setting aside that the Guardians have no visiting Committee, and bearing in mind that they had actually ordered these articles, and had also directed their contractor to supply bedding, and had issued advertisements for tenders, I cannot attach blame to them, since my official connexion with their Board. And the Commissioners will, I trust, agree with me, that the difficulties I have to meet are associated with, and almost inseparable from, the locality in which the workhouse is placed in the Union; so distant as it is from towns where the Guardians could supply themselves with materials and contractors for executing necessary works. I regret to state that Dr. Bodkin's brother who accompanied him to the workhouse hospital about a week since, for the purpose of assisting him in his medical duties, died today of malignant typhus fever. I mention this fact with the view of assuring the Commissioners that I shall now find it still more difficult to induce the Guardians to visit the house. Within the last week the weather has been most inclement and has brought with it a vast increase of disease and misery. In 1922, the Irish Republican Army occupied the town and burned down the workhouse. Apart from a few small fragments of wall, the workhouse buildings are now completely demolished and the site is occupied by a factory. 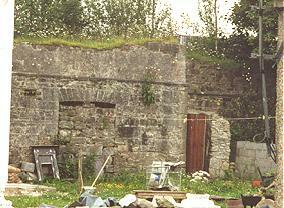 Clifden Union workhouse site, 2000. Clifden Union workhouse wall, 2000. Galway local archives, Island House, Cathedral Square, Galway. Holdings include Board of Guardians' minutes (1849-1913).